Uttar Pradesh government can conduct written examination for recruitment in the posts of instructor (anudeshak) in Upper primary schools of Uttar Pradesh. Such information is being received from trusted sources. 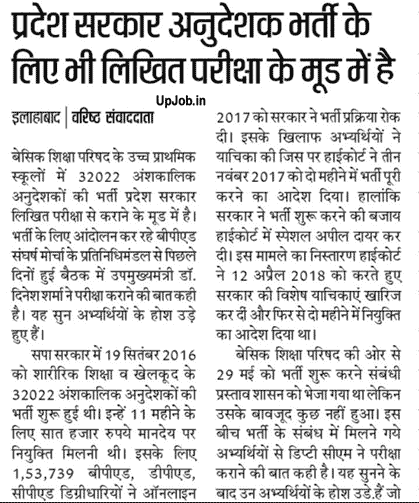 State government is in preparation for the conducting written examination for the UPS of Basic shiksha parishad (Basic Education Council), the recruitment of 32022 part-time instructor’s selection. The Deputy Chief Minister, Dr. Dinesh Sharma has spoken to the representatives of the BPED Sangharsh Morcha, who is conducting the movement for recruitment, to conduct the examination last evening. In the SP government, on September 19, 2016, recruitment of 32022 part-time instructors of physical education and sports started. Anudeshak was to be appointed on an honorarium of 11 months. Candidates were to be appointed on honorarium of ₹ 7000. For this 153 739 applicants had applied. Only bp.ed candidates applied for recruitment. After that applications for recruitment were invited. But the new government stopped this recruitment process. Against this the candidates filed a petition in the High Court. The High Court ordered 3 November 2017 to complete the recruitment in two months. However, instead of starting recruitment, the government filed special appeal in the High Court. The case was settled on April 12, 2018. Under this, the special petitions of the government were dismissed and again the order was made to complete recruitment process in 2 months. The proposal for introduction of recruitment on May 29 by the Basic Education Council was sent to the government, but in spite of that nothing happened. In the meantime, the candidates who are about to get an appointment with respect to the recruitment are satisfied after hearing the words of the Deputy CM who will be examined.